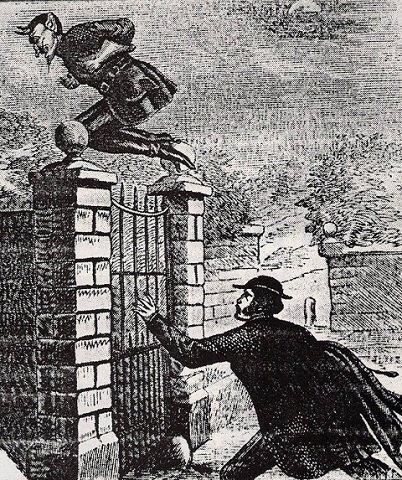 Spring-heeled Jack’s was one of London's greatest monsters. This talk explores appearances in and relationship to the Victorian city. One of London's greatest monsters, Spring-heeled Jack has held the city's imagination in his claws since he first appeared as "a ghost, a bear, and a devil" right up to contemporary comics and internet radio dramas featuring the leaping horror of legend. This talk explores Spring-heeled Jack’s appearances in and relationship to Victorian London. It considers his origins in the capital, and the way the metropolitan press gave life to a strange urban legend that went on to terrorise the rest of the country. Dr Karl Bell is a Senior Lecturer in History at the University of Portsmouth. He has published on a variety of topics linked to magic and the supernatural in nineteenth-century Britain. He is the author of two books, 'The Magical Imagination: Magic and Modernity in Urban England' 1780-1914' (Cambridge University Press, 2012), and 'The Legend of Spring-heeled Jack: Victorian Urban Folklore and Popular Cultures' (Boydell and Brewer, 2012). The latter won the 2013 Katharine Briggs Award.